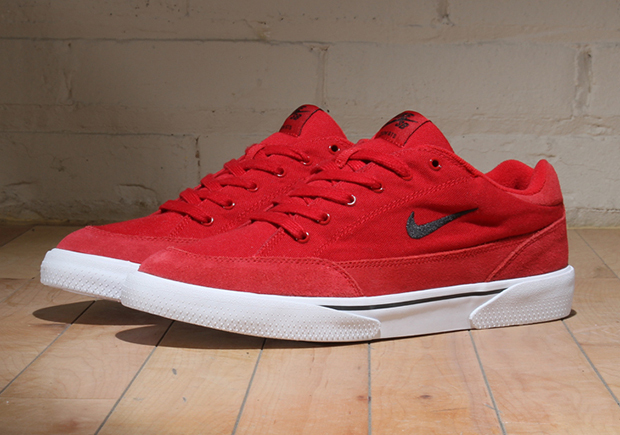 The Nike GTS skates on in its new life in the Nike SB line with this latest look in Gym Red. The combination canvas and suede-reinforced upper goes all red, with black accents up top and a solid white sole for the always-classic sneaker color combination on the “Great Tennis Shoe” updated with Zoom Air cushioning. The casual tennis model turned performance skate shoe is arriving now at select Nike SB providers like Premier. The post The Nike SB GTS Paints Its Canvas With Gym Red appeared first on Sneaker News. I love the Nike Kyrie 2 Kyrie-Oke. Ok, that’s a bit of an exaggeration. I think the shoe is perfectly fine and is a great entry into the still-growing Kyrie 2 line, but I think the nickname is an amazing play on words that really hasn’t gotten enough love in the sneaker community. Maybe it’s because my love of slightly corny wordplay is right up my alley while the 8,592,483rd Crying MJ meme is breaking my will to live (just kidding, they’re both great in their own way), but I thought this commercial that features Kyrie’s “hit” R&B album was priceless. So Kyrie then asked his Twitter followers to come up with their own names using the Kyrie pun. The results were beautiful and beautifully awful like the internet is wont to do. Sometimes this job just writes itself. Here are some of our favorites as we check out the Best and Worst Kyrie-Oke Puns. Best: Basketball Metaphor Or Something Deeper? Worst: Good Job, Good Effort? @KyrieIrving Shooting Stars, KY in the Sky. @KyrieIrving I like the sound of Ky-Rain!!! @KyrieIrving , "baby, you ky-reek of awesomeness." Best: Kid, What Do You Know About Classic Jay Z Albums? @KyrieIrving I didnt mean to message her, it was just a kypo. I Ky-ant believe its not butter. Fractured Leg (Thin-ky Need to see a doctor). The post Sneaker Satire: The Best And Worst Nike Kyrie 2 Kyrie-Oke Puns appeared first on KicksOnFire.com. Sometimes the sneakerheads get it right. When images of this Laker-themed Nike Kobe 11 first leaked, the 8:24 on the heel was more than a fine name as it was obviously meant to be a tribute to Kobe Bryant’s amazing career and the two number he wore in the NBA. Then it’s revealed that Nike’s official nickname for this shoe is actually “Eulogy”, which is meant to honor who has uh, passed on to another dimension (that’s a Dragon Ball Z reference). Yeah, a little too morbid there, Nike. Maybe we should stick to the 8:24 instead. Regardless of the name, one thing that is for sure is that Laker fans are going to eat this pair up as one of Kobe’s final signature shoes that he will actually wear on the court. Learn more about the shoe by reading up on the Nike Kobe 11 8:24/Eulogy here. The post The Nike Kobe 11 8:24 Changes Its Name To Eulogy (Video) appeared first on KicksOnFire.com. Our first look just came at the beginning of the month, but the release of the latest “Aunt Pearl” colorway to the Kevin Durant signature line is now already upon us. 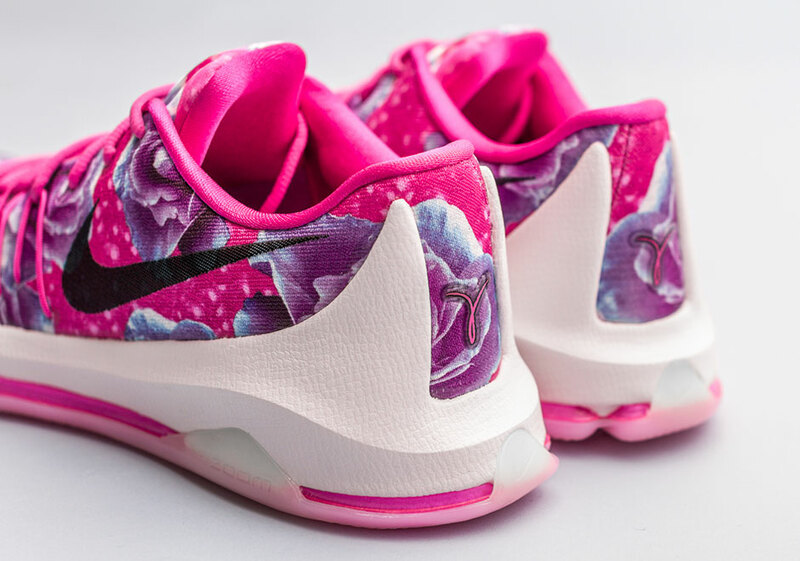 KD’s late aunt who passed away after fighting cancer is honored once again, this time on the Nike KD 8 which goes fully floral, featuring a vibrant pink-based printed upper with purple roses and pearls throughout. With proceeds from each pair going to the Kay Yow cancer research fund, the “Aunt Pearl” KD 8 Premium release tomorrow, February 22nd at select Nike Basketball retailers like Wish ATL. The post The Nike KD 8 PRM “Aunt Pearl” Releases Tomorrow appeared first on Sneaker News. The Nike Air Force 1 High goes varsity with this new look featuring a sporty vintage feel. That aesthetic is achieved with a classic team colorway in blue leather with stitched white Swooshes, striped ankle straps, and a gum rubber outsole for the finishing touch. Part of a pack with matching looks in red and black that we previewed earlier this month, the “Coastal Blue” Air Force 1 High is arriving at select Nike Sportswear retailers like Rock City Kicks right now. 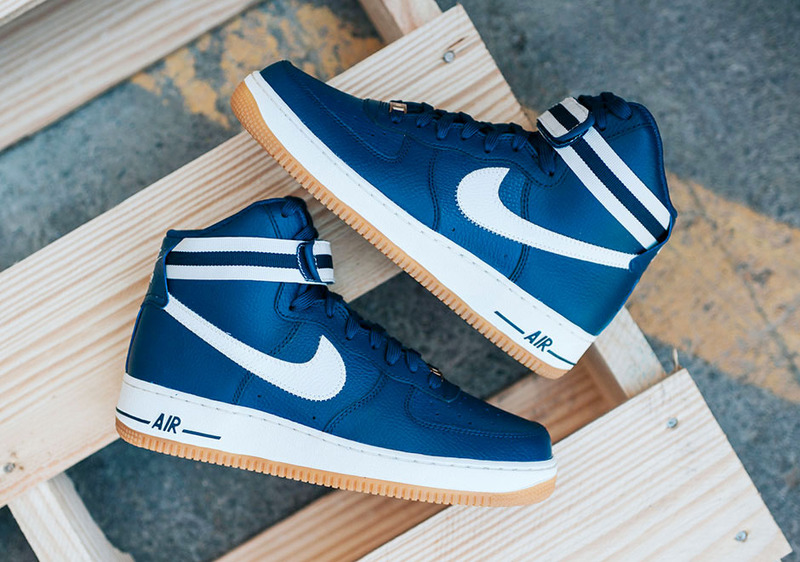 The post Nike Air Force 1 High ’07 “Coastal Blue” appeared first on Sneaker News. The Nike Mayfly is back and it has to be one of the strangest creations that Nike has ever made. Created for long distance runners, this model was build to only last an average of 100km. Let me explain. A while back, Nike created a shoe for long distance runner that is so lightweight and flexible that it usually doesn’t last past 100km before it starts “self-destructing” and falling apart. Making its initial debut back in 2004, the Mayfly will make its return this year debuting in three tonal offerings consisting of blue, black and red graphic uppers paired up with white accents and a white sole unit. Set to drop in the near future, are you interested in picking up pair? Let us know in the comments below. While the creative design process is “different”, I want to get the most bag for my buck. If this shoe is going to give out after 100km (62+ miles), I really don’t think it’s worth purchasing unless I’m running a important marathon or race or something of that nature. The post The Nike Mayfly Is Prepping For Its Return appeared first on KicksOnFire.com. For the most part, the states (US) hardly ever gets to see releases of the Air Max Plus arrive at our local retailers. Nike usually makes the model a AU exclusive and this pair is no different. If you don’t mind taking the extra steps to acquire these sneakers, these could also be yours. Let’s take a look at the Nike Air Max Plus Chili Pepper. The shoe comes in a red gradient fade accompanied by the patent leather hits found on the toe of the shoe. White branding appears on the side panels, tongue and heel of the shoe, wile the tonal Air Max equipped sole unit and laces tie up the monochromatic look together. What do you think? Let us know your thoughts down low. The colorway looks really nice on the shoe. Opting to go for the tonal look was a good decision by Nike. Although we hardly ever see these stateside, I wouldn’t mind owning a pair. The post The Nike Air Max Plus Chili Pepper Is Now Available Internationally appeared first on KicksOnFire.com. The Nike Air Max 2016 has been one of the more interesting installments of the Swoosh’s flagship visible air-wielding model. Sure, the combination of an engineered mesh upper, dynamic flywire, and a 360-degree air max outsole has been the standard for the past three years, but here the placement of the Swoosh and minimalist design cues make this silhouette a subtle and complex must-have. Today we get a look at an angelic all-white rendition, one that features 3M hints on the exposed flywire support system and forefoot Swoosh to perfectly coincide with an icy outsole. What do you think of this Air Max 2016? Check out more below and we’ll keep you up to date on the latest NSW updates right here on Sneaker News. 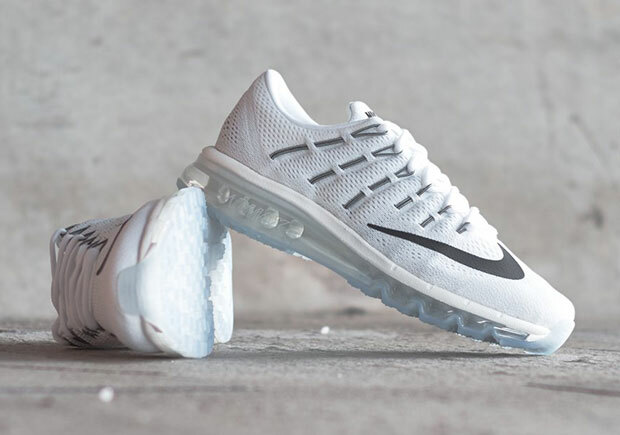 The post The Nike Air Max 2016 In Angelic All-White appeared first on Sneaker News. As each week goes by, we inch closer and closer to the end of Kobe Bryant’s magnificent career that spans two decades with one team. The argument regarding where Kobe stands among the all-time greats will be a never-ending one, so it’s better to enjoy the occasion rather than waste time analyzing a career that has produced endless accolades and five NBA championships. This upcoming purple/gold colorway of the Kobe 11 is indeed a “Eulogy” to Kobe’s career – one that will be remembered as long as the game of basketball goes on. Get your hands on the Nike Kobe 11 “Eulogy” on February 27th at select Nike Basketball retailers worldwide. The post Nike Basketball Presents A “Eulogy” To Kobe Bryant’s 20-Year Career appeared first on Sneaker News. The All Star/Northern Lights Foamposite has come and gone and we can now focus on the next Foamposite release of 2016 which will be the Pro Platinum colorway. This Pure Platinum Foamposite Pro falls in line with previous pairs that have looked to colorways of the Nike Air Yeezy 2 for inspiration. Even though Nike won’t come out an say it, this Pure Platinum colorway takes inspiration from one of the colorways from the Air Yeezy 2. Pure Platinum and Wolf Grey can be seen dominating the upper while a Bright Crimson inner liner and green glow-in-the-dark outsoles finish things off. Here are the latest images of the shoe that is scheduled to release on March 12th for $250. Be sure to keep our Nike Air Foamposite Pro Pure Platinum launch page bookmarked to stay up to date with the latest images, videos and other breaking updates. We know that Nike will not admit that this is another jab at Kanye but we all know the truth. Out of all three colorways that were inspired by the Yeezy 2 this is probably the most wearable and as a result the best. It?ll be a pass for me though. The post New Images Of The Nike Air Foamposite Pro Pure Platinum appeared first on KicksOnFire.com. The past couple of years have brought us Foamposites that seem like they were inspired by colorways that were first seen on the Nike Air Yeezy 2. Now for 2016 we’ll be seeing the release of the Nike Air Foamposite Pro in a Pure Platinum colorway that resembles the Pure Platinum Yeezy 2s. Looking at the shoe we can see that Pure Platinum dominates the foam shell upper while a Bright Crimson inner liner and green glow-in-the-dark outsoles finish things off. This Pure Platinum Nike Air Foamposite Pro is expected to release on March 12th for $250. We know that Nike will not admit that this is another jab at Kanye but we all know the truth. Out of all three colorways that were inspired by the Yeezy 2 this is probably the most wearable and as a result the best. It’ll be a pass for me though. The post Nike Air Foamposite Pro Pure Platinum appeared first on KicksOnFire.com. Previously known as the Nike Kobe 11 8-24, it turns out that this upcoming colorway of the Kobe 11 has been dubbed the Eulogy and draws inspiration from Kobe’s retirement and his glorious career as a Los Angeles Laker. The definition of eulogy is as follows: “a speech or piece of writing that praises someone or something highly, typically someone who has just died.” While we all know that Kobe is alive and well, he IS saying goodbye to the game of basketball so this sneaker is essentially a send off since he’s retiring. This Kobe 11 comes dressed in a Hyper Grape Flyknit upper with White and Black detailing as well as an icy blue outsole. The heel of the right shoe features the numbers 8 and 24, the numbers that Kobe wore as a member of the Lakers. The left heel is then hit with red stitch detailing. Look for the Nike Kobe 11 Eulogy to land at retailers on February 27th for a retail price of $200. Will you be picking up a pair? Let us know in the comments below. 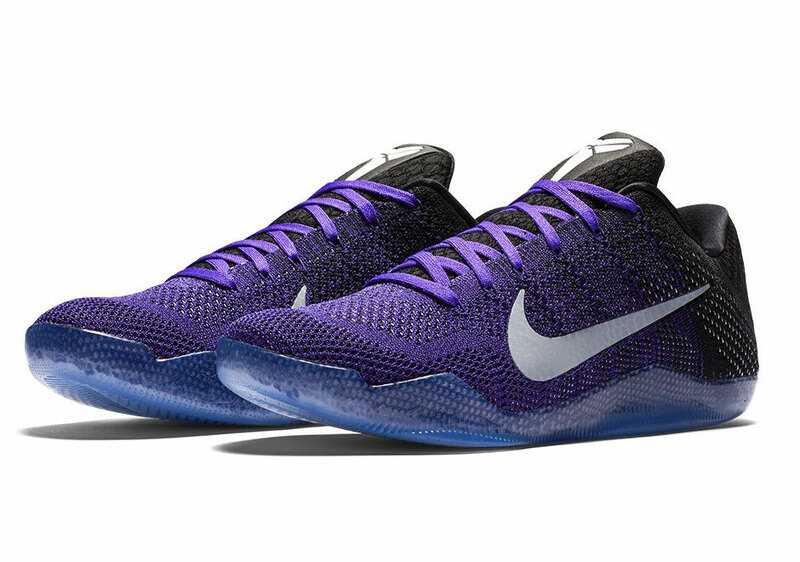 This is easily a must-have colorway of the Kobe 11 for all fans of the Black Mamba. If you?ve been a fan of Kobe since his #8 days then you?ll truly appreciate the significance of this pair. The post Say Goodbye To The Black Mamba’s 20 Year Career With The Nike Kobe 11 Eulogy appeared first on KicksOnFire.com. With the weather still being pretty cold in many parts of the country Nike has been focusing on the mid-top versions/colorways of the Nike Air Force 1 Ultra Flyknit. But with the warmer days not too far ahead of us we’re beginning to see the low-top colorways hit retailers as well. Two of the first colorways that are already available at select Nike retailers are the all-white pair and the black multicolor variation. The all-white pair is pretty much like the OG all-white leather pair but the upper is composed of the lightweight and breathable Flyknit material with leather only hitting the Swoosh, tongue, and heel tab. The other pair features a multicolor Flyknit upper with black detailing on the midsole/outsole, Swoosh, tongue, inner liner, heel tab, laces, and eyestay. Which one are you feeling more? Let us know down below and look for both pairs at select Nike retailers now. That all-white pair looks nice but white Flyknit is a big no-no if you like wearing clean sneakers. The black multicolor pair would be the option that I would go with. The post Get Your Hands On The Nike Air Force 1 Ultra Flyknit Low In Two Colorways appeared first on KicksOnFire.com. Have you picked up a pair of the Nike Air Max 2016? A handful of different colorways have already released with most of them being of the colorful variety. If you’re the type that’s been waiting for that all-white pair then you won’t have to wait much longer. Here’s our first look at the Nike Air Max 2016 that’s done in all-white engineered mesh with 3M detailing on the exposed Flywire and Swoosh on the forefoot that shows its true colors when hit by the light. Just like every other Air Max 2016 this pair features the 360-degree air max midsole along with an icy blue translucent outsole. Is this all-white Nike Air Max 2016 a thumbs up or thumbs down for you? Let us know in the comments below and look for them to hit stateside Nike retailers in the near future. I own a pair of the Nike Air Max 2015 and the 2016 is very similar with the only changes being the placement of the Flywire and Swoosh. However this all-white colorway is a dirt trap and would be impossible to keep clean. These will have to be a pass for me. The post The Nike Air Max 2016 Goes All-White appeared first on KicksOnFire.com. A handful of Nike Basketball Player Exclusive sneakers just hit retailers. If you happen to be a fan of Paul George, Isaiah Thomas, Draymond Green, DeAndre Jordan or DeMarcus Cousins then you can scoop up each player’s PE sneakers right now. Paul George and Isaiah Thomas have been laced up with their own colorways of the Nike Hyperlive while big men Jordan, Green and Cousins have been outfitted with their own colorways of the Nike HyperRev 2016. Every pair can be found now at select House Of Hoops locations for $110 each. Will you be supporting your favorite player/squad and picking up a pair? I’m not a fan of any of these teams so I wouldn’t buy any of these sneakers. I’m still waiting on the DeMar DeRozan PEs to drop. Where they at tho? The post A Handful of Player Exclusive Nike Basketball Sneakers Just Hit Retailers appeared first on KicksOnFire.com.